Sun., July 22, 2018, 8 p.m.
CARNOUSTIE, Scotland – Francesco Molinari was the “other” guy, a check-your-program placeholder, somebody to watch Sunday when the wall-to-wall spectators blocked a clear vantage of the superstar in his pairing, Tiger Woods. 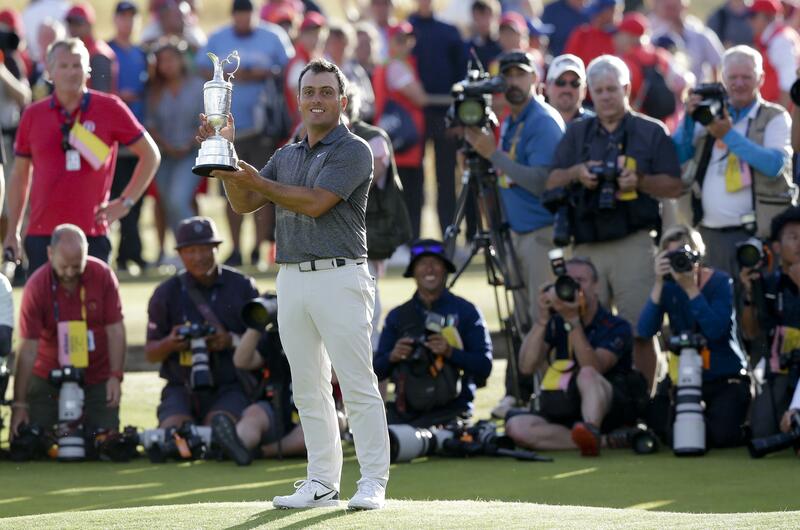 Not many people imagined it would be the unassuming Molinari who would quietly assemble another brilliant round – no bogeys all weekend – to claim the British Open for his own. Molinari shot a two-under-par 69 to finish at eight under for the tournament, becoming the first Italian to win a major championship. The sun was shining all day, but Molinari unquestionably was playing in a long shadow cast by a 14-time major winner making an unlikely return to relevance. The fans were so fixated on Woods that they shouted his name even when Molinari was standing over his ball, ready to make a swing. In the end, the most compelling drama came not from the leading men, but the co-stars. It came down to Molinari and Xander Schauffele, playing two groups behind him with defending champion Jordan Spieth. Heading into the final hole, Molinari was two strokes ahead of Woods at seven under, and tied for the lead with Schauffele, who was about to tee off at No. 17. It was shaping up as a possible playoff between two lesser-known players. But Molinari would birdie No. 18, and Schauffele would bogey No. 17, creating a scoreboard gap that would never close. You could hear reality sinking in that Molinari could actually win. Late in the round, those rapid-fire camera clicks from photographers inside the ropes weren’t focused entirely on Woods. They were split, with a flurry of click-click-clicks on both players. Immediately after his round, with TV cameras trained on him, Molinari sat in a room below the grandstands at No. 18 and buried his face in his hands, trying not to look at the remaining action unfolding before him on the monitors. Schauffele, 24, who attended San Diego State and is in his second year on the PGA Tour, wound up in a tie for second with Justin Rose, Rory McIlroy and Kevin Kisner. Molinari played his final 37 holes without a bogey or worse. According to ESPN, he’s the first major champion since Steve Elkington at the 1995 PGA Championship to play the final two rounds without a hole over par. No extrication was more impressive than that of Woods, whose life had fallen apart on and off the course. Until this tournament, he hadn’t played four rounds of a major in par or better since the 2010 Masters. He briefly held the lead Sunday, before dropping back with a double bogey then bogey, shooting an even-par 71 – his third such round of the championship – and finishing tied for sixth at five under. Although he said he was “a little ticked off” at himself for missed opportunities Sunday, he loved being back in the mix when it counted. Woods was in attendance at Wimbledon to watch his friend, Serena Williams, compete in the women’s singles final 10 months after giving birth to her first child and enduring a difficult recovery. Williams lost in straight sets. The perspective of golf’s other top competitors has changed as well now that Woods is back in the picture. Published: July 22, 2018, 8 p.m.